Nerve damage may mean that you no longer notice the stone in your shoe, due to the loss of sensation to your feet. This could then lead to an injury you can’t feel, and possibly infection. If you have poor circulation, any injuries or infections to your feet (i.e. cuts, burns or scratches) they will take longer to heal. This is due to less blood flowing into the arteries in your feet. Blood provides energy to working muscles and aids in healing any tissue damage. Most foot problems in people who have diabetes occur when injuries – often infections – go unnoticed and untreated, or when healing is delayed due to poor circulation. A six or twelve monthly foot assessment by your podiatrist will help to detect any changes early – before they become a problem. 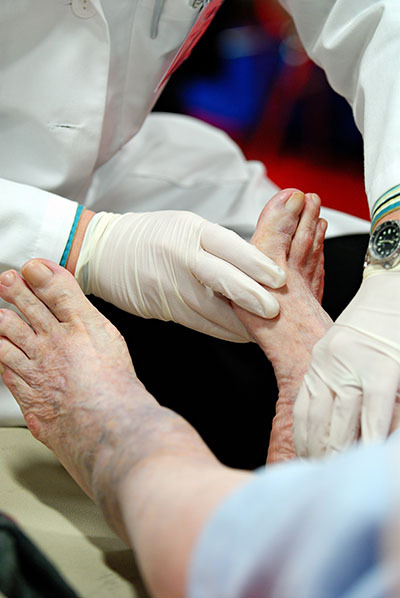 In an assessment, your podiatrist will examine your circulation, test reflexes, vibration and pressure sensitivity.